Snoring can have an adverse impact on your sleep quality, as well as anyone sharing your room. Fortunately, you can take action by investing in the right anti-snoring solution. One type of product is a nasal dilator or vent. These simple devices are inserted into the nostrils before sleep. By opening up the airways, they enable proper breathing. This, in turn, reduces snoring and promotes higher-quality sleep. One of the options available is Calily Health Anti-Snoring Nose Vents. Calily Health is the manufacturer of a range of health, beauty, and lifestyle products. The company has grown quickly since its inception in 2013. The product line includes anti-snoring nose vents, which come in a pack of four. The company specializes in natural products designed to improve health and well-being. A division of Calily Life, Calily Health sells many of its products online through sites such as Amazon and eBay. You can also purchase products through the company’s Calily Life website. There are many different solutions available to reduce snoring. Anti-snoring nose vents and dilators are a popular choice. This is because they offer simplicity and convenience. They can be inserted with speed and ease. These devices are designed to open the airways so you can breathe properly while asleep. As a result, snoring is reduced so you and your partner can get a better night’s sleep. There are a number of manufacturers that offer nose vents and dilators, which means you can benefit from plenty of choice. SnoreCare and MUTE are amongst the other brands you can purchase. 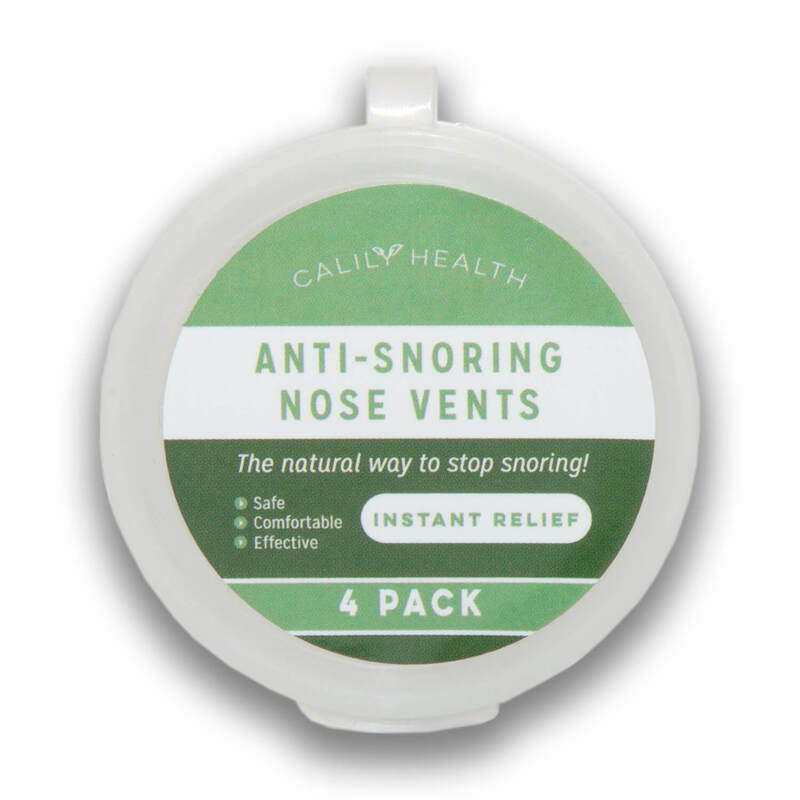 The Calily Health Anti-Snoring Nose Vents, also sold as Gideon anti-snoring nose vents, are advertised as an effective solution to stop snoring. The pack contains four nose vents, which many consider excellent value for money. However, it is important to remember they come in two different sizes so you won’t be able to use them all. These nose vents are made in China, and this was a cause of concern because there is no verification regarding the safety of the materials used. There is also no information regarding how long the vents should last. The nose vents cost $15.00 per pack, and a travel case is included. They are free from BPA (bisphenol) and are made from medical-grade silicon. Before testing out these nose vents, I noticed they had pretty good reviews on Amazon. 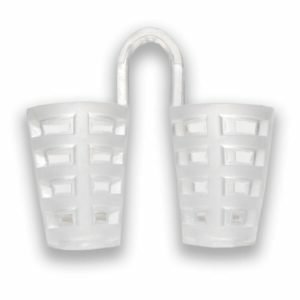 The product has an overall rating of 4 stars, with many reviewers stating they were comfortable, effective, and represented great value for money. When my nose vents arrived, I opened the packaging and was pleased to receive a handy travel case along with the vents. The vents were quite hard and I quickly realized the stiffness would cause some discomfort. They also felt cheap and as if they would break apart easily. On the first night, I inserted the nose vents and found they were very easy to put in. However, as expected the stiffness of the product did make wearing the vents uncomfortable. I chose the largest vent on the first night and found this was a little too tight due to its size. Unfortunately, the vent came out at some point during the night. I’m not sure whether it fell out or whether I removed it in my sleep due to discomfort. When I checked my snoring app in the morning there was no difference in my snoring rate. However, this was most likely due to the fact the vent came out while I was sleeping. My experience with these vents on the first night made me think I was better off using the MUTE nasal dilator. This is fully adjustable to suit different needs, which I think makes it better value for money as well as ensuring a better fit. 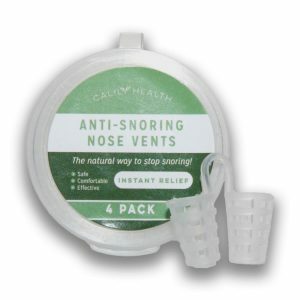 I tried the Calily Health Anti-Snoring Nose Vents again the following night. However, this time I tried a different size and this was far more comfortable. It was very easy to insert and I enjoyed a good night’s sleep while wearing it. I checked my snoring results on the app when I woke up in the morning. The results were far better this time around, as the smaller vent had remained in place all night. The app showed I only snored for 18 percent of the time, and my snore-score was 20. Compared to an average night without the vents, this reflects a 40 percent reduction in snoring. Based on my experience over two nights, I found a number of pros and cons with these nose vents. 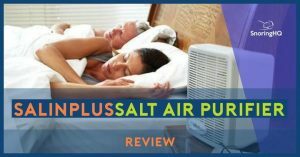 After trying two different vent sizes over two nights, I did manage to achieve good results from this product. You do need to make sure you choose the right size to benefit. I also think it needs to be used alongside another anti-snoring product such as a pillow or mouthpiece. On the downside, I don’t believe the product is good value because you are limited in terms of the vents you can use. It also needs to be replaced every two weeks or so. The product did not come with any information on cleaning and maintenance. In conclusion, I think that the MUTE nasal dilator is the better option because of its adjustability and comfort levels. With this dilator, I can get good results and I’m not paying for vents I won’t be able to use. An alternative to nasal dilators is the Theravent device which encourage mouth breathing instead of snoring through the nose. For mouth breathers that snore there are many options. Both the SnoreRx and ZQuiet mouth guards have good track records.